"Mah No 1" by Joxfield ProjeX. It was released in 2009 and was the second of the two long tracks on "Shimmering Mah No 1" album. 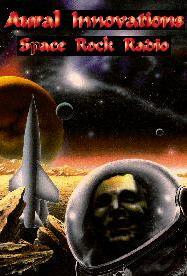 This album is so far our most downloaded effort, close to 36.000 downloads. Our hit record? This 28 minutes track brings you from minimal electronic patterns into a simple joyful melody of Kraftwerk kind over to some psychedelic surroundings and then, after that, we leave you for discoveries of your own. For your download follow the soundcloud link. 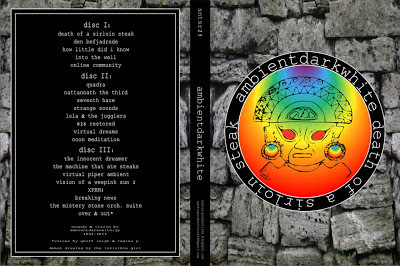 AmbientDarkWhite/Joxfield ProjeX - "How Little Did I Know"
From "Death of a Sirloin Steak", a 3 CDR set in DVD case - To be released in March 2013 on Santos Productions. AmbientDarkWhite - another Joxfield ProjeX concept. A lot of Joxfield ProjeX' music is dense. The music of AmbientDarkWhite is filled with air. Fill your lungs ! Get wings ! Fly away ! ! ! Video by Master AltRev - Thanks ! The Ghost of Dark White Morning - Out Demons Out ! ! ! In 2005, after a short break of 30 years, Yan and Oax reactivated their musical explorations, this time as Joxfield ProjeX. The first weeklong recording session happened in Bråna, Dalsland, Sweden in the very beginning of May 2005. No preparation except lust to make music. A lot of improvisations and instant composing. The very first track to record was "Hurricane", a simple two chord improvisation, to find the "feeling" for the week of recordings to follow, get used to equipment. Just a distorted guitar and some wild, nasty keyborad. No overdubs. Pure live in the studio. The result of that weeklong session became Dark White Morning, a 2 CDR set printed in about 20 copies, mostly given away to friends. "Brana Funk" is from the same weeklong session in 2005 that brought "Hurricane" and resulted in the 2 CDR disc Dark White Morning. I can't resist uploading it. This track is wild, messy and mad and when recording it was so loud in the room where we were playing that we actually couldn't hear anything but the buzzing noise we made, the sound of the programmed drums when lost, we couldn't hear anything, but caught a feeling that was so huge that we didn't want to stop, just went on. The track is both terrible and charming in my opinion, not too tight I may say. Programmed simple drums, guitar, keyboard. Another guitar and keyboard was immediately added after recording of the basic track. On Disc 1 i liked tr3 & 4 best and on Disk 2 i liked the guitar work on tr4 and the wild gliss on tr 8 ("Brana Funk")." 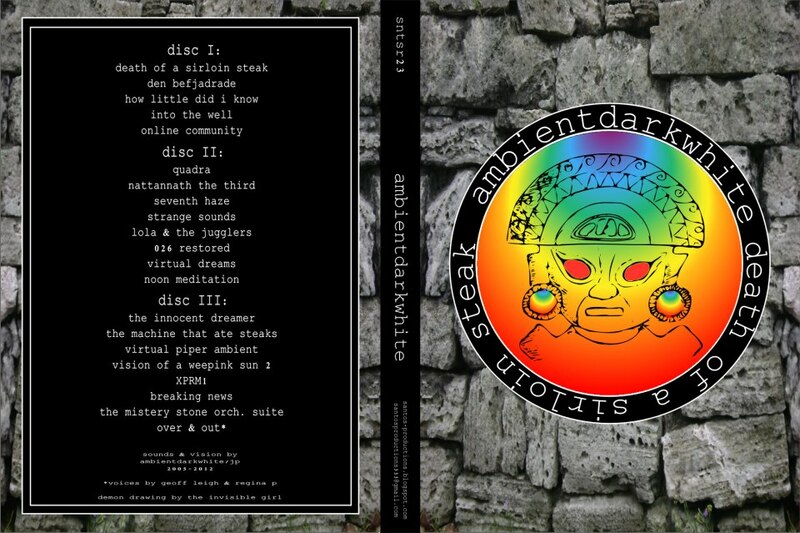 AmbientDarkWhite - Death of a Sirloin Steak - A 3 disc set in a DVD case. To be released on Santos Productions later this spring. AmbientDarkWhite? Well, maybe a Joxfield ProjeX moniker for doing some non-Joxfield JoxfieldProjeX-music... Or is it not? Wait and see. Find out youself!